First, there’s the sun. It’s big, it’s the reason there’s light at all. It’s full of energy, and this energy could power the earth forever. In fact, on the day that someone discovered coal could provide fuel or electricity, they found it because the sun was shining. The sun is the reason we live (if it went out, we’d all be dead in a week), and it’s also the reason that we, on a human level, have energy. So sun is the reason that we see and the reason everything around us is seen. And on the day that humans invested the energy they got from the sun towards finding energy that didn’t come from the sun, they chose where to level off. The process of garnering nonrenewable energy like coal involves bare stripping mountains, blowing them up, and harvesting the coal. This of course does a number on air, water, mountains, and cities alike. Mind you, this entire process, one that moves progressively from order to chaos, has happened under the sun that exists to power everything anyways. Perhaps the reason it was for so long ignored in the energy conversation is because it can’t be owned, held, or even looked at too long. It can only be partnered with. Solar technology exists to partner with this boundless free energy. It builds an energy structure using another plenteous resource, second only to sunshine: silicon. Something about silicon laced with a couple other ingredients garners the sun’s energy as well as a plant. These siliconized panels are placed in an open area (the roof or the ground), and they start taking in the sun’s rays. The rays are sent through a inverter that translates this direct current of sunshine (DC) to an alternating current (AC). AC means that the energy is now ready to run through outlets and into whatever needs energy to function. Want to know more about how solar works and how it rights the wrong done to the planet? 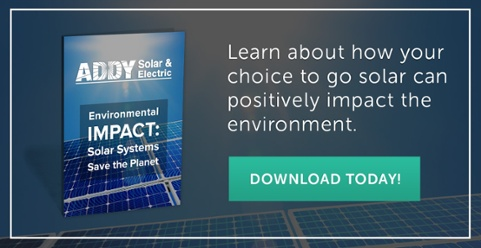 We published articles on ‘The Basics of Solar’ and the ‘Environmental Impact of Solar’. So we’ve walked you through how Solar Energy saves the planet, and I’m sure by now you’re thinking, “Okay, so it saves the planet, and that’s good, but what if I can’t afford it? What if my part in saving the world is just recycling water bottles? That’s enough right?” First of all, right on for recycling those water bottles. You rock! In the last section, we found out that nonrenewable energies aren’t sustainable, and that the way to right this is by taking advantage of renewable energy sources. We learned that the sun exists to power things, and that if someone has a solar system the sun will power their home for free. For the why, let’s look at the financial side and how doing your part in a cleaner planet might cost you less than you think. Let’s say a homeowner pays $250/month for electricity. They are considering the switch to solar, but they’re worried that they cannot afford it. Let’s also say that a solar system costs $30,000, and then there’s a 30% off tax reduction because the government incentivizes a sustainable future. So net, the system costs $21,000, and the homeowner gets out a loan. They choose to payoff this loan at a similar price that they’d paid for monthly nonrenewable energy. They pay 300 dollars a month, and at 70 months (5.8 years) they pay off their solar system. 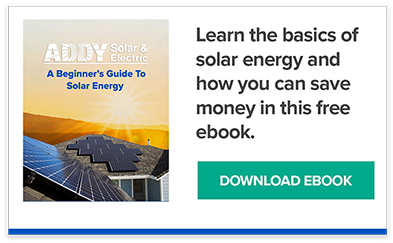 The solar system performs the way they were told it would, and the family pays no more than a couple dollars a month to the electric company (We did a case study with some of our clients, click to here to see how Northern California solar owner’s are experiencing solar energy). At the end of the 5.8 years, the family is now enjoying free energy, and have essentially become their own power plant. How long will this family get to enjoy the fruit of their system? The system comes with a 25 year warranty, and that warranty acts more like a floor for the system’s lifetime than it’s ceiling. By paying $50 dollars more a month, the homeowner has set themself up for decades of free energy. Why did the homeowner make this decision? 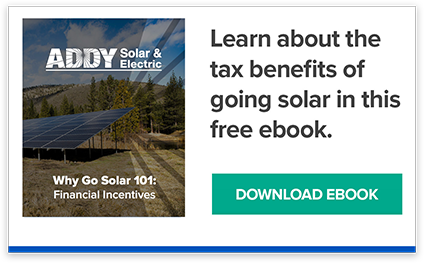 They realized that every homeowner must pay (x) for energy, and that the homeowner can choose between paying for energy they’ll never own or for an energy structure that will channel free energy. The homeowner chose the latter, and now they’ll enjoy a lifetime of free energy. Interested in knowing how much you could be saving? Tell us how much you’re paying now and we’ll tell you how much you could be saving by going solar. 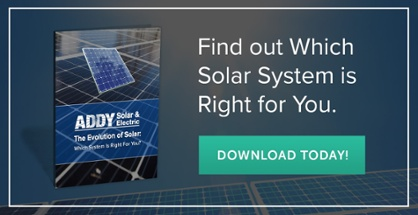 By, now you’re probably thinking, “Wow, who knew?” Who knew that the sun could produce all the energy I need, or that the system I need to get free energy, if broken down, is actually pretty affordable. When you zoom in on other questions like, “what happens when the grid goes down?”, or “what are the other financial incentives?”, or “is my roof ready for it?”, we’ve got you covered. What you need to know is that not only is solar possible for you, it’ll be one of the wisest decisions you make. Like any good investment, it’s about losing a little today, so you can win when you get to tomorrow. So how does solar technology work? Solar panels are made with mostly silicon, and are designed to garner the sun’s energy. The energy goes through an inverter that translates the energy from direct current (DC) to alternating current (AC). Alternating current is the kind of current you’ll need to power your house. As long as the sun is shining, the panels take in the sunlight and keep the flow of energy moving from the sun and into electricity. Solar panels haven’t always been as efficient as they are today, but in the latest evolution of solar technology, designers have made some significant adjustments. The system that Addy Solar likes to install is the Fixed Voltage System. 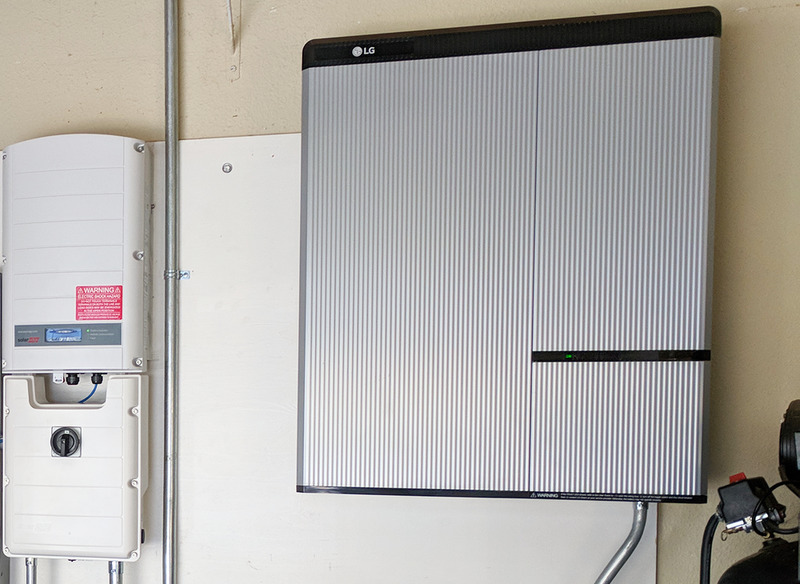 The Fixed Voltage System uses a single inverter to communicate with an optimizer to help each panel run efficiently and at its highest potential. The optimizer is a solid-state component, and it optimizes the efficiency of each panel output. These optimizers allow the systems to operate at their full capacity and wattage. Before the Fixed Voltage System, the popular system on the market had many inverters. Those systems, the micro inverter systems, did not allow the panels to operate at their full capacity. The inverters were not big enough to allow for the full potential of a panel. With the higher wattage optimizers, the solar panel can now operate to its full KW capacity. These are the workings of the newest type of system in the solar industry. All in all, Addy Solar works with top of the line solutions to provide you with a system that lasts a lifetime. So how are people in Redding, Ca experiencing solar energy? A few months ago, we did a case study where we interviewed some of our clients to find out how they were doing (more on that case study here). Before these homeowners made the switch to solar, they were promised that solar energy would nearly eradicate their energy bill. After a few years time, we checked with these homeowners to find that, indeed solar energy had brought these homeowner’s electric bills to almost nothing (median, $3.00/mo). While all of these clients are experiencing virtually no electric bill today, they are paying more a month (in terms of energy), than they were before. The difference is that now, instead of paying that (x) a month for energy, they are paying the (x) towards an energy structure. Once the energy structure is paid for of course, the energy is free. These systems are collecting all the energy the owners need, and they do so with consistency. Clients are seeing solar energy sustain their energy needs throughout the whole of the year. This adds further resolve to the frequently asked question, “Well what about when it’s raining, or when it’s winter?”. These studies show that when the system’s production is analyzed at at the end of a full year (and not just an isolated look at a rainy day), the system performs up to the standard it claimed it would. All in all, these case studies brought evidence to the “never go back” assertion that solar energy makes. Solar energy gives its owners the financial space they need to direct finances towards a personal, sustainable energy structure. Below, is an energy from one of our clients in Redding. She says that throughout the summer her system is overproducing (code for making more energy than she needs). These are some real life examples of how people right here in Redding are experiencing solar energy. 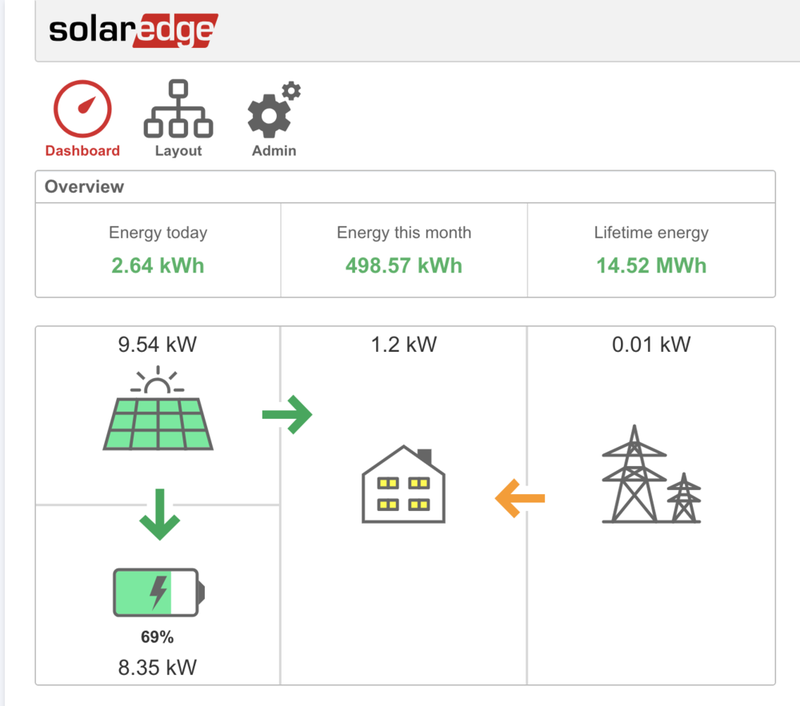 Screenshots from JC’s Solaredge portal. Screenshot 1: This photo is showing that most of the solar energy that is coming in is charging the battery. The battery is being replenished so that, when it is nighttime, the home has stored energy ready to use until the next morning. This way, the home has solar energy reserves ready to go and doesn’t need to buy energy from the grid. 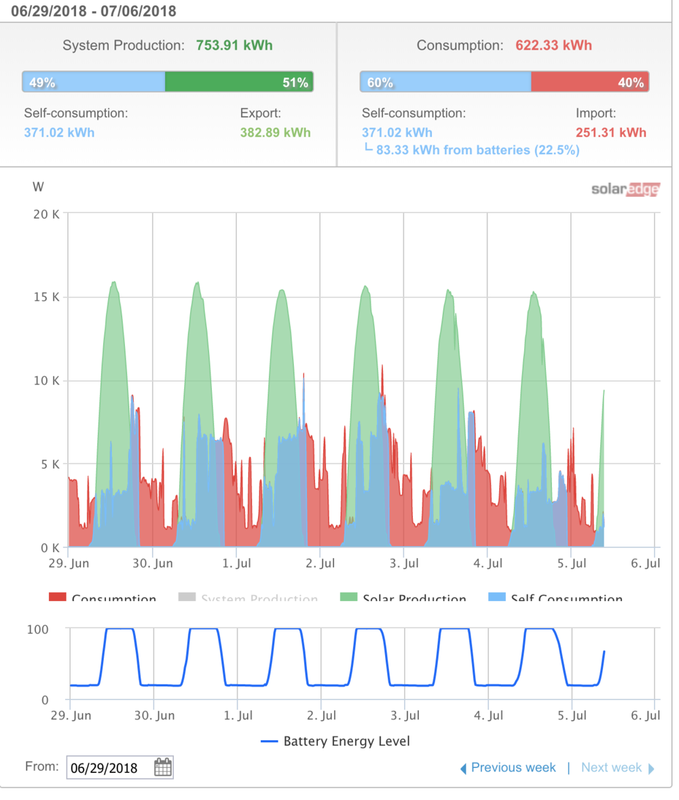 Screenshot 2: This photo shows the output in kwh for each panel during different times of the day. All of these screenshots are from a Solaredge portal; one that provides the homeowner with data for their system’s production. In this picture, you’ll notice that the top rows are a darker shade of blue than are the bottom rows. The lighter (blue) the panel, the higher energy output the panel has. When the panels are darker, it could mean shading or in worst case, a panel going bad. Addy monitors this data to ensure that your system is running at peak efficiency. Screenshot 4: This last photo is the monthly energy output of the solar system in the form of a bar graph. What’s Next For You And Solar Energy? We’ve determined that solar is not only saving the planet, but that it’s also bringing people right here in Redding, Ca energy savings. We found out that without solar energy, a person keeps paying for energy and never sees an end. Yet with solar, when a person pays off a system, they get free energy from the sun. We found that for locals here in Redding, solar does live up to these claims, and that these people are experiencing the payout they had hoped for. Where does that leave you? Would you like to keep paying electric bills? Or would you like to see an end? Give us a call, and we’ll give you a free estimate. We’ll start by looking at your last year of energy bills, and determining the size system you’ll need at your house. Next, we’ll determine where the system should be installed (roof or ground), and what must be done to get your house solar ready. Then, we’ll come in and install the system, and once it’s up, we’ll be monitoring your system and providing maintenance when necessary. We know you couldn’t install a system at your house, or even know where to start, and that’s okay. We do. With hundreds of systems installed in Northern California, we are learned in installing the system that’s right for you. We install a system that’s taylor made for your energy needs, and let the sun do the rest. After all, it’s never failed us yet.